wrap-around cockpit lounge with table. maker port side to help keep your guests refreshed. transom door gives access to a huge swim platform. windshield provides easy access to the foredeck sun pad. sun-worshippers the cockpit lounge can be converted to a sun pad. 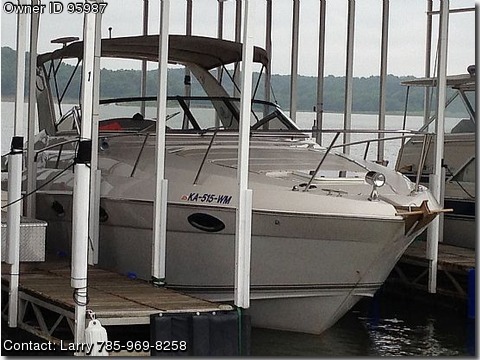 features a Garmin GPS, a depth sounder, and a Standard VHF radio. cockpit deck lifts electrically for easy engine service. with a top speed around 40 knots. drives with stainless steel propellers.